Berry Plastics is Proud to Accept the Tube of the Year Award for the French’s® Flavor Infuser® | Berry Global Group, Inc.
EVANSVILLE, Ind.--(BUSINESS WIRE)--Feb. 25, 2014-- Berry Plastics Group, Inc. (NYSE: BERY) is proud to be recognized as the recipient of the 2013 Tube of the Year Award for a food product with its French’s® Flavor Infuser® package / tube design. This award, presented by The Tube Council, is considered a prestigious recognition for innovative packaging manufacturers. 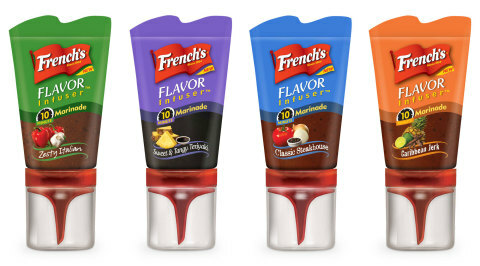 French’s® Flavor Infuser® brand’s owner, The French’s Food Company, partnered with Berry Plastics’ Design Center to create this unique, one-step marinade package using a laminate tube, custom ‘spike’ marinade injector, and clear overcap. By working directly with the Berry Design Center, The French’s Food Company was able to realize speed to market – moving from ideation to package manufacturing in a short, nine months. Marinating usually requires a lot of preparation and can be messy. Plus, since marinades are usually only applied topically, the marinade’s flavor doesn’t penetrate throughout the meat. French’s® Flavor Infuser® is a convenient, no-prep, no-mess marinating solution that by injecting the marinade through the custom “spike,” flavor is infused throughout protein in just 10 minutes. On the shelf, the value proposition is easily identified by the consumer. The clear overcap allows the consumer to see the bright red spike and clearly understand the ease of using the squeeze tube design. “The French's package is a multiple component package, utilizing both stock and custom designs via state of the art tube technology that delivers the customer experience the brand was looking for. The French’s Food Company asked Berry Plastics to help deliver a package that could be a ‘one time’ use and eliminate the typical ‘mess’ of marinades,” said Alex Abbott, Berry Plastics’ Director of Product Line Management. Berry Plastics is a leader in laminate tube manufacturing among other packaging components, which allowed RB to use both stock and custom products when creating the French’s® Flavor Infuser® package.